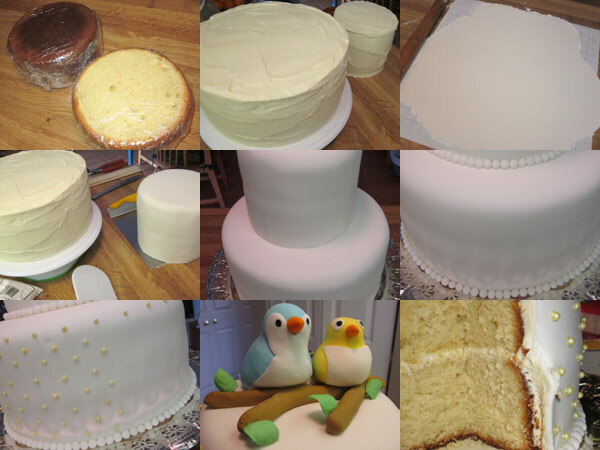 The stages of building the wedding cake. I had the joy and privilege of making my first wedding cake this month. It was for my sister and her new husband’s reception last weekend. I had lots of fun making it, and it was great to see the reaction from the bride and groom and the rest of the family. It’s been an experience full of firsts for me. My first time using fondant to cover a cake and to sculpt decorations, plus my first time using piping gel and my first time working with sugar pearls. All in all it was a great experience, but one that took quite a few more hours than I expected and a few more supplies than I already had. The crucial supplies I added to my baking collection were a mat for rolling the fondant and a fondant smoother, both bought on the advice of a cake-maker more seasoned than I am. I baked the cakes, a two-layer 10″ and a two-layer 6″ two weeks ahead and froze them. I also sculpted the fondant topper a week ahead, since I’d read that fondant needs that time to dry and solidify. I also tested my piping abilities in advance, and decided that store-bought sugar pearls would be a much better idea to trim the edged of the cake. I may take the time to make by own fondant pearls next time, but I can’t overstate the time-savings from the pearls. I had some inspiration photos to work with and you can see them here, here and here. I was also going with the theme of blue and yellow birds that grace the invitations and other stationery. The cake recipe I used was this one, but think I’m going to do some more tweaking to make it a little more moist. The advantage of this recipe is that it’s a little more dense, so it holds up well when stacked. If you want more detailed information on making cakes, I recommend the Wilton Web site. I won’t go into detail about all the steps, but I have to say it was a lot of fun and I would definitely do it again for the right occasion. Congratulations guys! 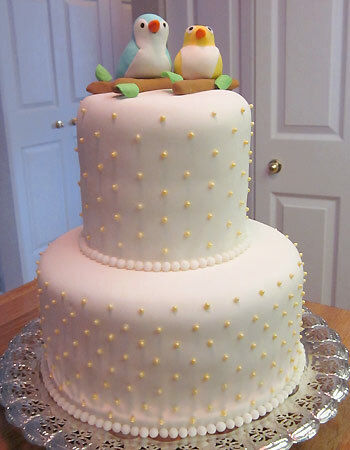 I know you’re too modest to say it, but everyone at the reception loved the cake, especially the edible bird toppers. It went over so well, some thought it had been done by professionals. At least one guest wanted to hire you to do a cake for her wedding. Really beautiful, Amanda. Definitely does not look like a first attempt! !